Nirmal Shekar, one of my favourite Sport writers once wrote in an article, “Nostalgia, to be sure, is a disease, a disease that not even a double dose of reality can cure. It is as common as cold in many of us who look back to our golden yesterday and then sigh, ‘Ah, nothing is what it used to be.’” And at this very moment I can feel my entire system giving way for that incurable disease to take complete control over me; to drag me to my home town where you would see me celebrate the festival of Onam with great pomp and show. It was sheer fun then, filled with immense joy. But with the passage of time, most of us leaving our home town in pursuit of a decent career, all such celebrations have come to an end. Things do not look the same . There was always a lot of work involved on this festive day in preparing the delicious food served to the entire family. But today we get everything in packaged format. It was fun to be involved in lot of discussions on a day like Onam, for those were the occasions when all members of the family met at a single location. Hasn’t television taken away a major part of that fun by showing some special programs (most of which are really boring) on a day like Onam, including a couple of three hour movies that generally gets over in exactly double the time frame of the actual movie timing, with lot of advertisements every five minutes or so? Television to a larger extent has been largely responsible for making people look lazy on occasions of this sort. Why blame T.V., blame ourselves for switching it on and keep it switched on from dusk to dawn. Otherwise, there used to preparations for the festival starting as early as 4:00 A.M. Anyway, things have changed and it would be foolish on my part not to accept this change and adapt myself to it. 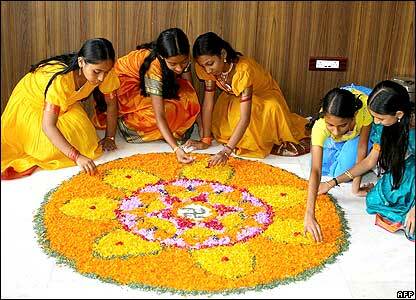 I have already written a post about the Onam festival here and I wouldn’t want to repeat myself. I wish all of you a Happy Onam. Please celebrate this festival of joy in whichever way you can . I am convinced on the exciting prospects of Sun Softwares, especially the ones that falls in the Identity Management stack. So it is no surprise to me that I am spending most of my time in the Sun Learning Services Classrooms going through the training on the Identity Management components. A couple of weeks back I could seize the opportunity to meet up with the Senior Product Manager of Access and Federation Manager and got to know from him the immense progress that the Engineering team is making in improving upon the features of the products. Frankly, it is a nice time to be a part of these positive developments in the software portfolio of Sun. Last week I met up with some nice folks from various organizations, who had come down to Bangalore from different locations to learn IDM 345. Most of them have positive feedback about this course and some of them are in fact looking forward to take up the advanced training on IDM viz IDM 4484. As of this writing, the course IDM 4484 is based on 5.5 version of Sun Java System Identity Manager. I am told that the IDM 4484 course based on the 7.0 version of Identity Manager is in the pipeline and is likely to be released soon. Sun today announced the decision to change the stock exchange ticker of Sun Microsystems from SUNW to JAVA. For those who are curious to know why such a decision was made, read what the big boss has written on his blog. Didn’t you hear about the landmark agreement between Sun and IBM to distribute the Solaris operating system (OS) and Solaris Subscriptions for select x86-based IBM System x servers and Blade Center servers? I wish you take a few minutes to read through the official announcement on both Sun and IBM websites. I just reached back Bangalore from Mumbai. The purpose of visit this time was to go through the Directory Server training for a few folks working for a leading IT Solutions company. Things went quite smooth, save the horrendous traffic jam that I had to tolerate on my commute from the venue to my hotel . It is high time that the Government take some corrective steps to improve upon the conditions of roads in Mumbai. Not that the other cities in India are free from this; still, being the financial capital of India, one would expect slightly better infrastructure in Mumbai. I am absolutely in no mood to write anything more, for the sleep is arresting me. Before I hit my bed, let me put on this blog the picture of my new friends.Good night . Today, India celebrates its sixtieth Year of Independence. At this juncture, I would wish to publish here an E-mail that I sent to a few friends of mine on this day in 2003. I wish, my dear readers spare some time to go through this note. powered by economic strength with value system. It has entered into me. on the earth, above the earth and under the earth. – Dr A P J Kalam. United Nations commemorates International Youth Day today. Should you find yourself interested in knowing how you could participate in celebrating the International Youth Day, please read this note published in the official website of United Nations. Do you own a startup Company? You may submit your questions, comments, questions and suggestions for the Sun Startup Essential program by clicking here. Today Sun introduces the Ultra Sparc T2 processor. You may watch the webcast about it here.